For developing student article writing skills, a structured process is hard to beat. There are many considerations involved in perfecting this kind of publishing. Though it's not part of English, SEO (search engine optimization) will come into play at some point, especially in professional settings. We can put that aside for the moment, because it's about much more than that. It's about writing something that gets noticed, shared, and remembered over time. What burning questions need to be answered? What do people need help with? What is it in the world I feel we could be doing more to address? What passions/issues keep me up at night? What can I write about that will still be useful in the near future? How do I write a "shareable" piece? How do I write something that doesn't lose relevance over time? The process of Solution Fluency mirrors many of the processes teachers are familiar with. One of these is the writing process. If you or your students begin article writing, the 6Ds process will be of great help to you. Before you begin, though, we suggest reading about why it's important to consider starting a blog. On the other hand, your students could be blogging already. Maybe they are looking for new ways to help thoughts flow freely and constantly as they write. 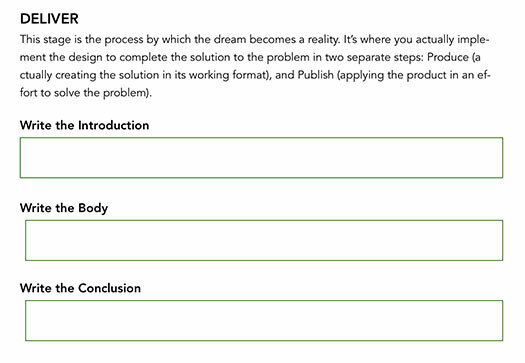 Based on Solution Fluency, the template we use for article writing has a flow from beginning to end. It was modified from a Hubspot blog where you can find more great resources on article writing. It guides any student writer in a quick, comprehensive method of organizing data, references, information, and ideas. 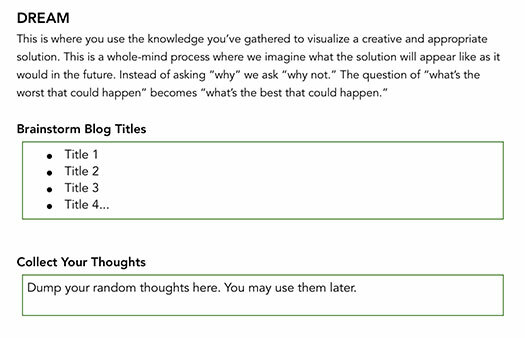 You can download the Solution Fluency Blog Template below. Students can use it as a format for article writing, as well as other writing projects. It's an editable document in Word format. Click the link and the doc should appear directly on your desktop for easy opening. Solution Fluency encompasses 6 processes: Define, Discover, Dream, Design, Deliver, Debrief. 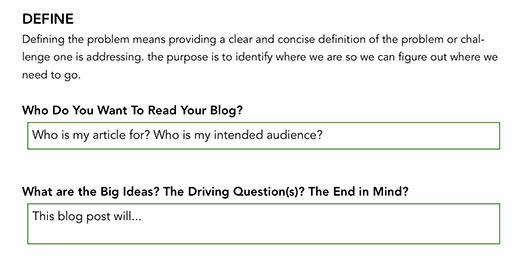 These processes are deeply rooted in Bloom’s Taxonomy, They also happen to be a great roadmap to creating a substantive blog or any report. You've got a shareable template to use. 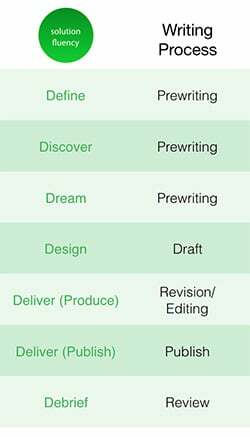 Let's look now at the 6Ds process in article writing. We'll also provide screenshots of the article writing template for visual reference. This entails deciding who your audience is and deciding your key takeaway. We call it your “Big Ideas,” or “the end in mind.” Don’t be afraid to change your key takeaway if you need to change direction during the writing process. This template is meant to be organic and can change as your thoughts take shape. The next step of the process is Discover. In this section, gather all links that you visit for research and that are related to your Big Idea. This includes links to videos, websites, infographics, pdfs, and quotes. Don't limit yourselves to Internet resources either. Maybe you have a document of your own in Google Drive—you can insert that link as well. The goal is to create a repository of resources for attribution when the article is done. It’s also a good idea to add a short description of the link for easy identification. Take time and really review resources thoroughly. Next, Dream about what direction the article should take. Start dreaming with a title, like before a baby is born when parents are already dreaming up names. Again, think of different possibilities. The top choices for titles might change as you write. Begin to imagine how your blog will look in the end. Will you use an infographic? Charts? Will you include catchy references to popular culture? Will the text be of a more serious academic nature? Write down your thoughts in this stage. These may or may not find their way into your final draft. It's a great brainstorming section. By now, you should have an idea of what your post will look like and its specific components. Take the time to jot them down. Remind students using the template there's a lot of pre-writing before they get to the actual writing. Let them know that's a good thing! This is the writing process in its highest-order stage. You are now full of information and ideas that simply need to be applied to a canvas. Here is where you do a lot of cutting, pasting, rewording, and starting over from scratch. Within this space, Creativity Fluency is most meaningful as you constantly reflect on your work. You can spend time rewriting the parts that don’t come together, and revelling in the parts that reflect your true genius! The Debrief section is a space to evaluate the work and the process. You can always come back to this later after a break to allow your brain to digest. Time now to toss the article to another team member for clean-up and adding graphics. You might also decide to finish it yourself. Part of the last step is also to go over the article for proper attribution of your sources. Since you compiled those in the beginning, it should not be too hard. Using a template brings the writing process into a context that is succinct and meaningful. You and your students may find that you need to tweak the template for your own use. Do what you need to do to make the process work best for you. Happy blogging to you and your super-creative students!